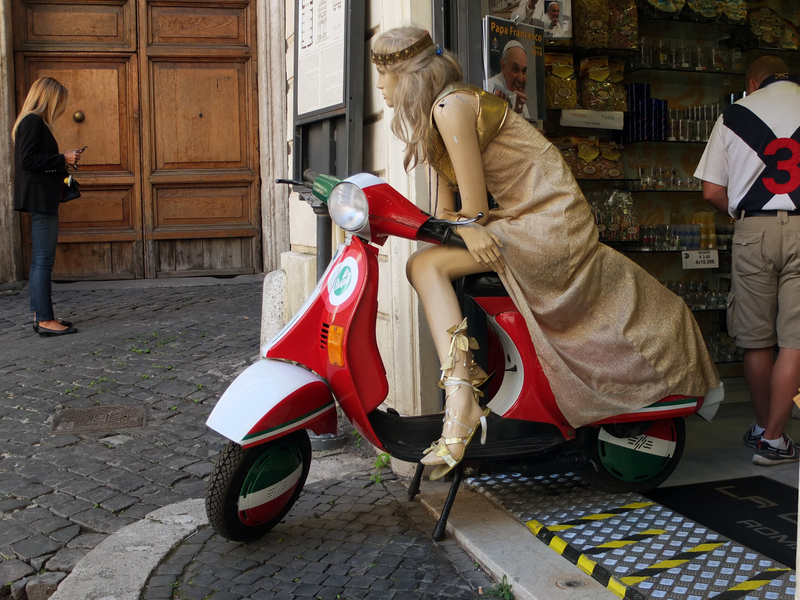 The 21st century Centurions of Rome are one of the silliest tourist annoyance but after so many years. They’ll wave their wooden swords at you, offer replica props for you to wear for a silly Roman photo. They’ll kiss your hands, bow or offer to slit your throats. 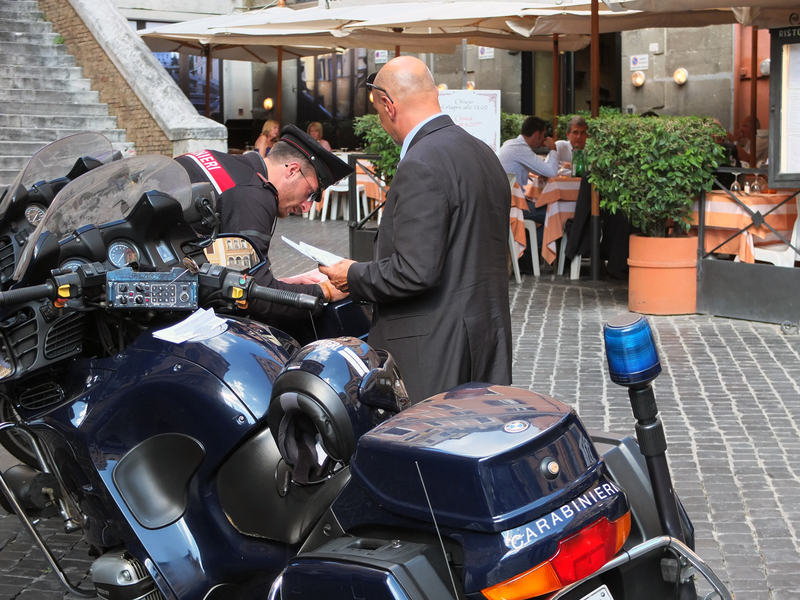 They come to work in costume, getting out of buses, trains small Fiats or on scooters. Their chest plates are polished metal or finely oiled leather. Their helmets are adorned with red or gold plumage or something that looks like a push broom. Their tunics are red or gold and always perfectly tailored. 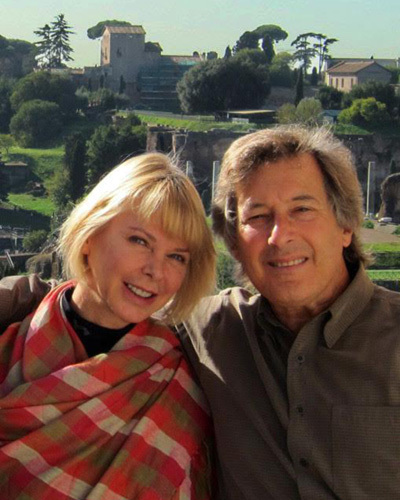 Their usual hangs are in front of the Coliseum, along the Via dei Fori Imperiale, near the Pantheon and by the Trevi Fountain. Actually, they appear wherever there are tourists. On an investigation into racketeering in 2011, three of the Centurions got into an argument with some tourists and swords were unsheathed. Even through they were only wooden and cardboard swords, the tourists turned out to be undercover cops and hauled the Centurions away to the local jail. 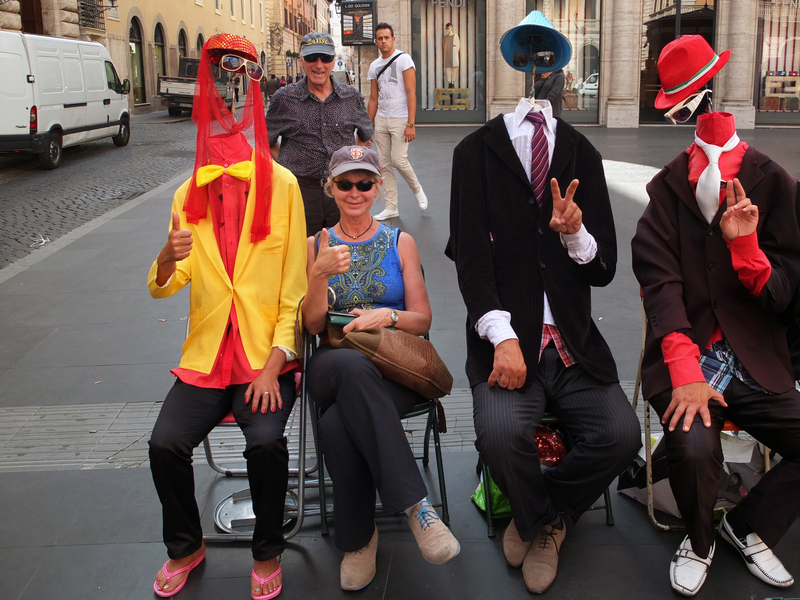 The costumed street artist have been demanding anywhere from 5 euros on up for a photo with them although the price is never mentioned before the photo opportunity. In April 2012, a grand Coliseum style battle between the costumed Centurions and the local Carabiniere broke out in from the of Coliseum when the Centurions refused to leave the premises. In the recent even to restore decorum in the ancient sites, both dirt on the ancient stones and Centurions are included. They’ve been extorting large sums from tourists for years and after too many complaints, the city is getting tough. Even though the Centurions have been banned from the Coliseum, they still show up. They can run pretty fast in those strap sandals when the police arrive. 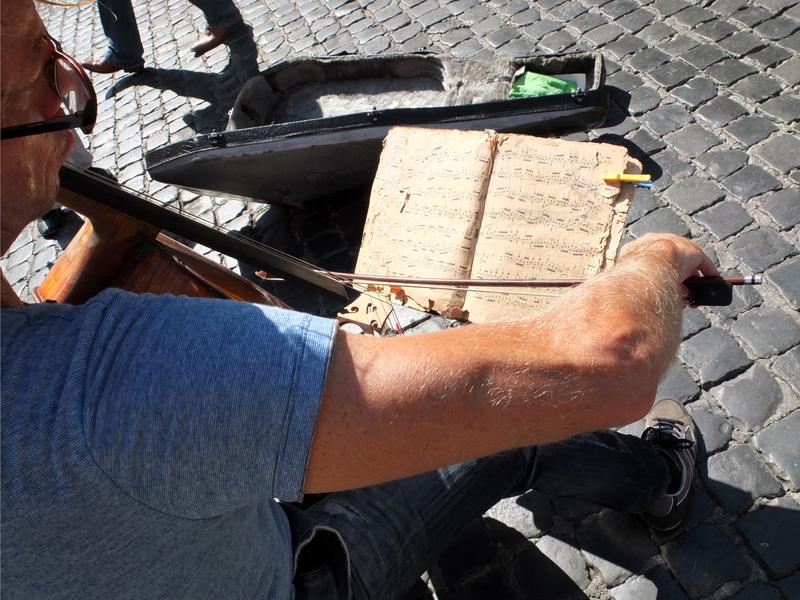 Rome is a perfect city for Street Artists who have been performing in these streets for over 2000 years. 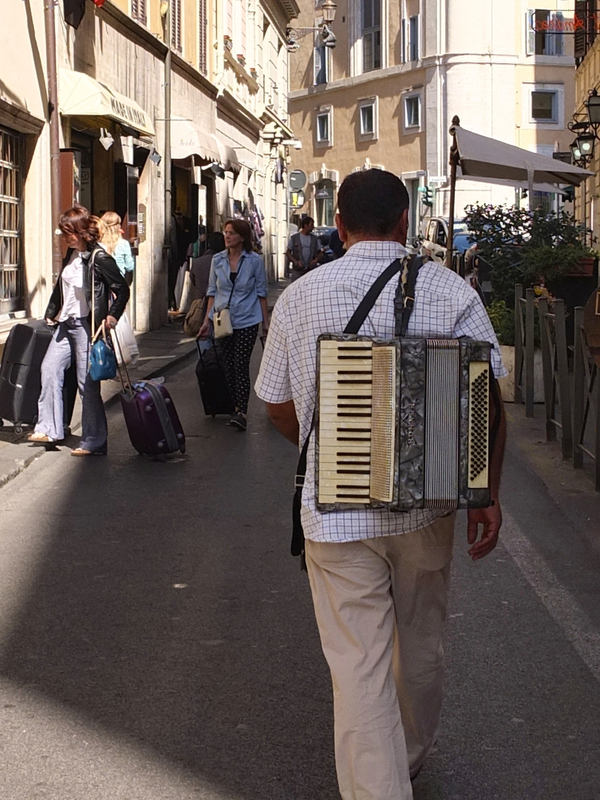 Accordions fill the streets with classic songs of Naples and the Theme from the Godfather, a standard for street accordions in Rome. There is a solo saxophone player who has maintained the same position in front of the Forum of Augustus every day rain or shine. 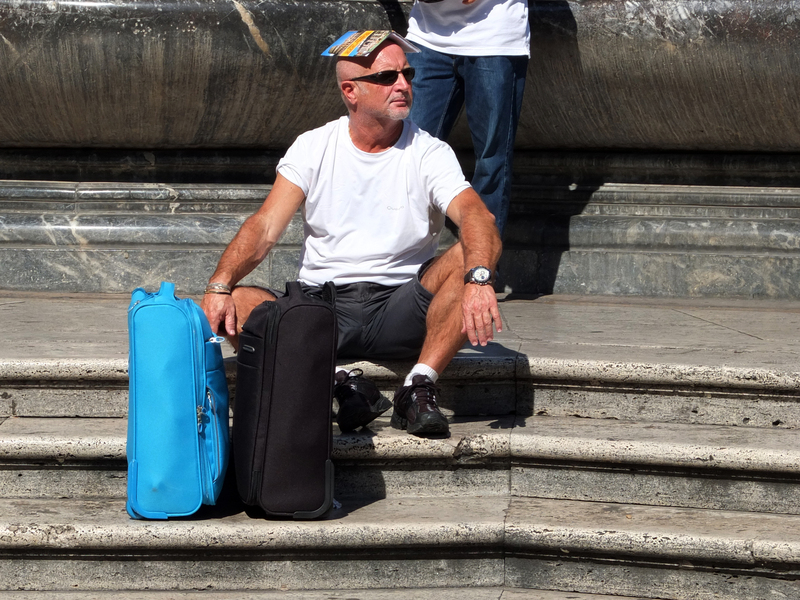 Classical musicians huddle under acoustic porticos in trios and quartets, sometimes a solo violinists will brave the exposure of the rays of the sun in order to get closer to the tourist traffic. Guitarists from all nations put out cups or hats. 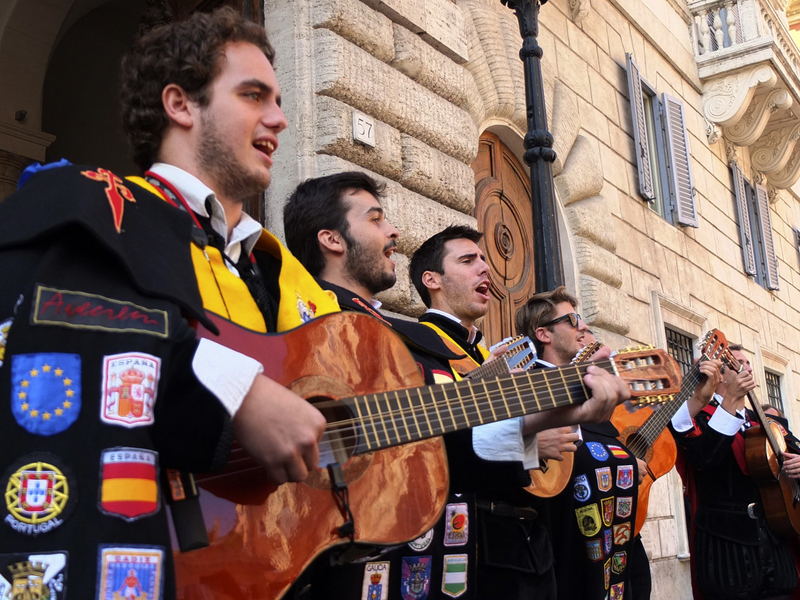 We saw a great recital sponsored by the Spanish Embassy near the Spanish Steps (of course). 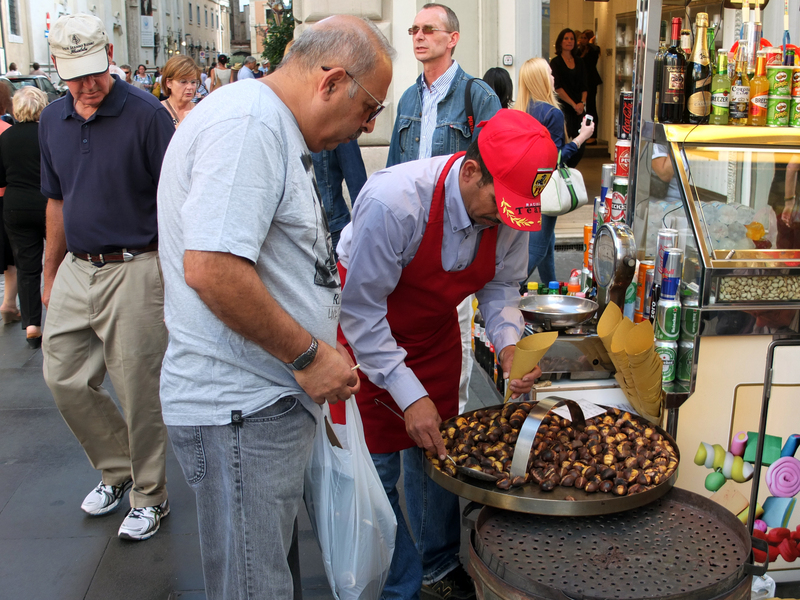 The smell of roasted chestnuts along the streets of the city is intoxicating and so much fun to watch. Aside from the Centurians, there are some great costumes along the streets. About a year ago in Majorca we saw a street artist levitate himself and hang over the Piazza balancing himself on a small stick. We thought it was wonderful then. Now, the trick is everywhere. Too much of a good trick can really ruin it. Yes, we’ve seen the stretchy knit standing Pharaoh Sarcophagus, the strange guy painted white and the other strange guy painted black. 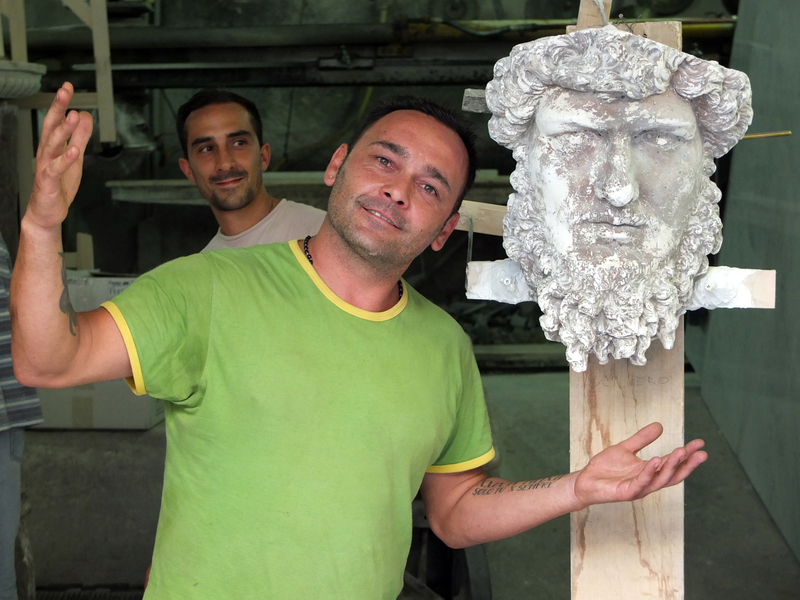 I can’t figure out why one of these guys doesn’t wear a toga and head wreath and stand next to one of the statues of the Emperors along via Dei Fori Imperiale. Here is our favorite costume of the visit, the Invisibles. Policemen are always on duty. They’re giving out parking citations to inconsiderate people who park their cars and scooters in Pedestrian Only areas. Not even the rain will stop the thousands from getting out to see this great city. 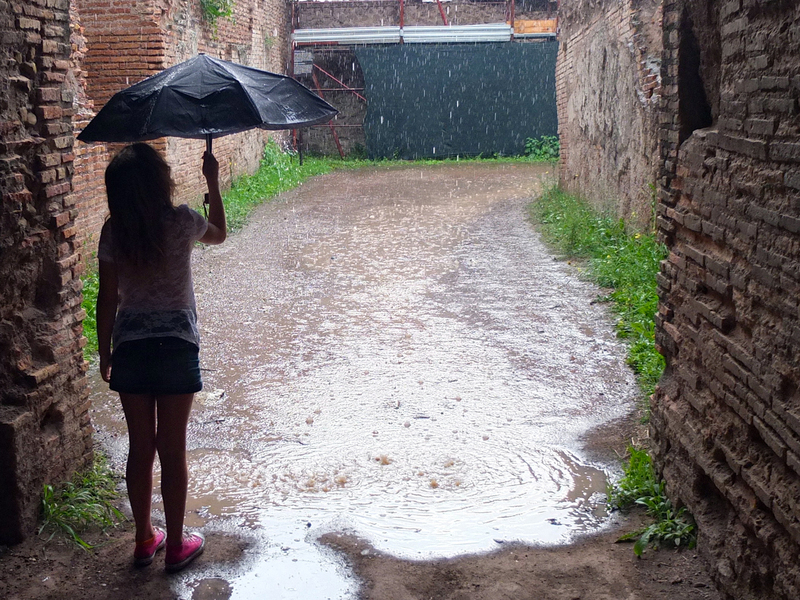 After the rain, everything goes back to normal. The sun brings back the heat and it can get hot in Rome. Shopkeepers ready themselves for the return of international shoppers. 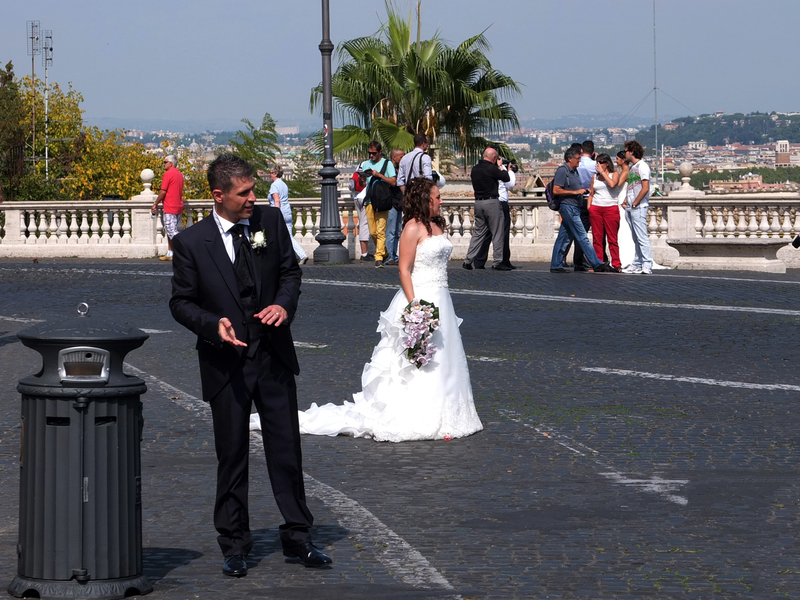 Wedding couples continued to circle the city for photo memories of the greatest day of their romance. 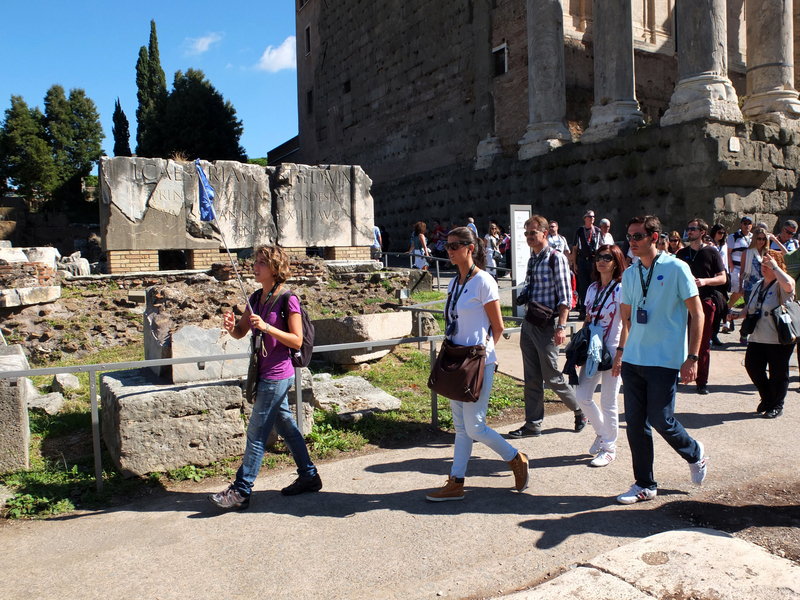 Groups of organized tours return to the ancient Fori. 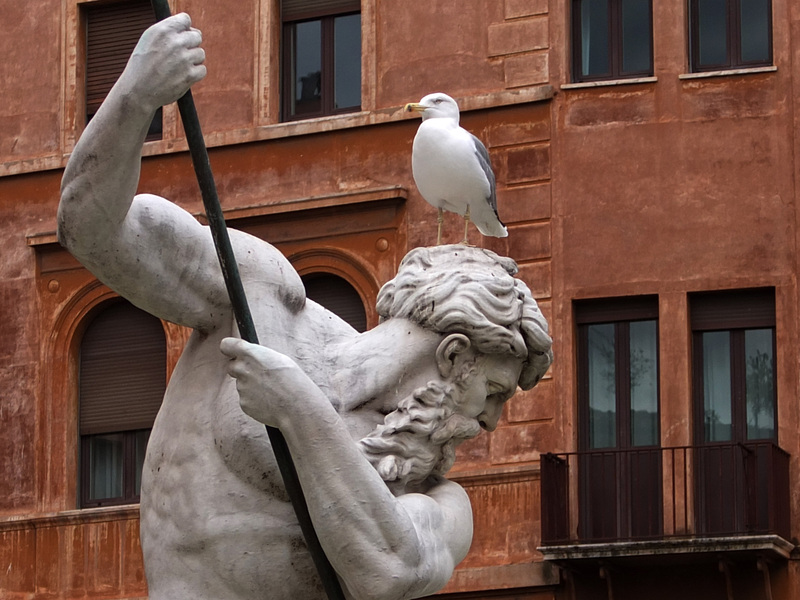 Birds return to their favorite positions on the heads of the great 16th and 17th century statues. 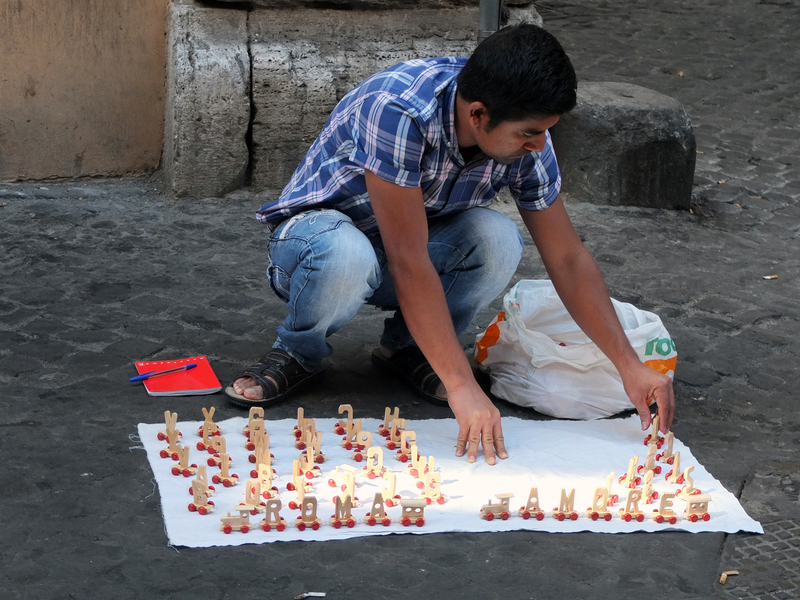 Immigrants vendors used to sell their knock off Designer bags on the bridges across the Tevere. Two of them lay the goods down on a blanket and while one watches for the police, the other speaks multiple languages to the international passersby. When a policeman is spotted, the items get scooped up quickly and they’re off and running. These days the knock off vendors have gotten even bolder and now sell the knock offs outside of the very expensive shops along the Via Condotti and other Fashionable streets near the Spanish Steps. Now you have a choice of paying or for the same bag. Who knows, they might even be made by the same factory in China? The “legal and licensed” immigrant vendors also display their wares on blankets along the main Piazze but they’re in no hurry to hide from the Police. As the day comes to an end, everyone gets ready for the second half of the Roman day, or the night time. Restaurants are warming the ovens and stove tops. The bars are filling up and pedestals of great statues of Roman Piazze are crowded with beer bottles and laughter. Some arrive early, some stay late, some are still trying to get there. It’s all part of a Day in Rome.